Below is the Robert’s Snow illustrator-and-snowflake feature schedule for Friday, October 26 (scroll down after clicking “read the rest of this entry”). 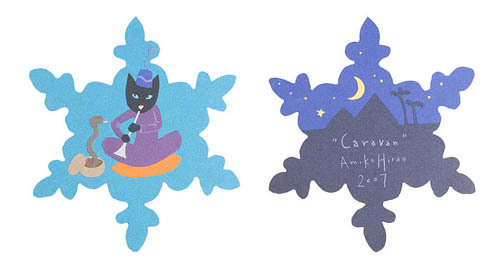 Featured here is Amiko Hirao’s snowflake for this year’s auction, entitled “Caravan” (*). I’m not terribly familiar with her work, but you can see some of it here at the artists’ agency, Studio Goodwin Sturges (click on “artists & authors”). And I have seen and enjoyed 2002’s All Aboard! (Little, Brown & Company), illustrated by Hirao and written by Mary Lynn Ray. She also illustrated 2002’s How the Fisherman Tricked the Genie: A Tale Within a Tale Within a Tale (Atheneum) by Christopher “Kitoba” Sunami. 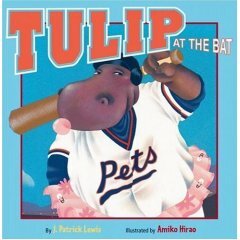 strated Tulip at the Bat by children’s poet and author J. Patrick Lewis was released in April by Little, Brown Young Readers, and next year we will see Just What Mama Needs (Harcourt) by Sharlee Glenn. 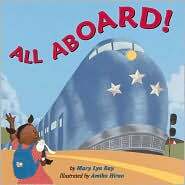 Again, I’ve only seen All Aboard! (and enjoyed it), but, hey . . . I’m just a messenger right now, trying to get people to buy snowflakes and raise money for cancer research. Amiko’s snowflake will be auctioned off in Auction 2 from November 26 to 30. Did you see yesterday’s features? I wish I had time to point out some highlights from all of them, as I enjoyed reading each one. You must see Julia Denos eating a picture book and all her beautiful art work. Jackie is smitten, and so are many of us who read that feature. I mean, she’s eating a picture book. Can she be my new friend? You see, I understand this urge . . . And did you see Margaret Chodos-Irvine’s sunflake, “To Be Like the Sun”? Beautiful. Thanks to each and every participating blogger for these snowflake/illustrator features. As I say every single day in case you’ve missed it, don’t forget this new page here at 7-Imp, updated daily, which lists all the illustrator features thus far in one spot, and it’s turning into a handy-dandy, way-cool illustrator resource for us Picture Book Nerds. * In case this is the first time you’re reading about the Blogging for a Cure effort, the illustrators and snowflakes that participating bloggers are featuring are only the ones that the Dana-Farber Cancer Institute had ready to go when this multi-blog event was organized. Remember that you can see all of the snowflakes at the Robert’s Snow auction site. There are many more beautiful snowflakes by more talented children’s book illustrators. Can I love Tulip at the Bat any more? I don’t think so!!! A League of Our Own, indeed… LoVE the bubblegum. Love it. The snake-charming cat is a great snowflake! !